Carver Briggs is one fourth of the Sauce Crew. 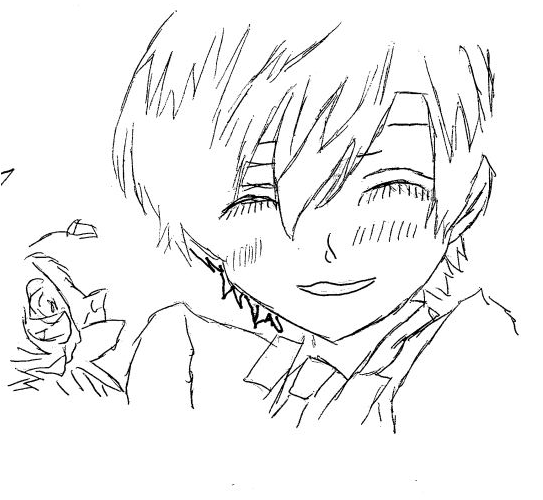 His three best friends Eli, Mars, and Blake comprise the rest. Right before their senior year, Eli, Mars, and Blake died in an horrible car accident. Carver wasn't in the car. He was waiting for his three best friends to come pick him up. He was so impatient that he texted Mars "Where are you guys? Text me back." Did his text message distract Mars causing the horrific accident? What if Carver had never sent the text message? The title refers to Carver spending a day with each grieving family saying goodbye. Yet each family seeks Carver's presence for different motives. Could they be trying to trick him into implicating himself as the cause of their sons' deaths? Could they be trying to understand the children that they lost? A strong narrative voice coupled with powerful, complex conflict means that this was a book that I could just not put down. Not only was Carver dealing with the grieving parents of his best friends, but he also befriended Eli's girlfriend, Jessmyn. Feelings develop between the two causing even more problems. I'm a pretty cold-hearted, cynical reader, but this book really affected me. I found myself inexplicably engaged with all the characters. Interestingly, I was emotionally invested in not only the teen protagonist. I also cared deeply for the parents even when they were in conflict with the protagonist. Tears may have fallen. I can neither confirm nor deny. This powerful book will surely speak to teens. If you are a fan of The Fault in Our Stars, this book may be for you. It's power is in its portraits of grief. Come check it out from the library today. Starr Carter knows how to act around the police. In addition to the talk about the birds and the bees, she also received the talk about how to behave should she encounter the police. One evening she has to remember the lessons of that talk. A policeman has pulled over Starr and her friend Khalil one night. Starr hopes that Khalil also knows how to behave. He doesn't follow the rules. He asks the cop questions. The situation escalates. Suddenly, Starr has a gun drawn on her while her friend is dead in a puddle of blood next to his vehicle. Starr is the only one who knows what happened that night. When the community hears that Khalil was unarmed, protests begin. The media gets involved. Starr wants to use her voice, but her parents fear for her privacy. No one knows that she is the witness to the shooting. This novel unfolds into the investigation into the police shooting. Starr struggles with the case as well as being a teenage girl living between two worlds: the world of her prep school and the world of her poor neighborhood. Will Starr use her voice to fight for justice? Will her school friends understand her? Will Khalil get justice? This amazing debut novel features one of the strongest narrators I've read in a long time. Starr's interior monologue is powerful as it provides insight into her struggles moving between two worlds and her struggles coping with the realities of this investigation. The characters are rich and well-developed. Starr's family is one of the best families that I have read in a long time. If you are interested in reading a story that could have been pulled from current events surrounding police violence and racism, this book is for you. If you love stories of unconventional families that come together in time of struggle, this book is for you. If you love well-written stories, this book is for you! Zoe allows her younger brother to go play out in the snow with their two dogs (fabulously named Spock and Uhura) as an impending blizzard approaches. When it is go time to bunker down, brother Jonah and the Trek Dogs are nowhere to be found. Zoe seeks them. Along the way she encounters a no-good, very bad, villain named Stan the Man. She also meets X, a bounty hunter from the Lowlands, who was tasked with bringing Stan the Man's soul back to the Lowlands. X is attractive and speaks like it is 1832 England. He can literally screen the sins of the bounty on his back. Did I mention he can turn water orange? He can. Zoe dug it. She even Instagrammed it. Once Zoe realizes that X is there to kill Stan, she doesn't want him to die even though he is a no-good, very bad man. She gives X a look. Her look is powerful enough to give X pause. Of course this means that Stan the Man escapes setting the major conflicts in motion. This novel is part fantasy. The parts that focus on X in the Lowlands are the best! The Lowlands sort of resemble a type of hell. Some of the inhabitants are bounty hunters who brings evil souls back to the Lowlands. What is really fun about this setting is that there are folks from different parts of the world and from different time periods. This novel is part mystery. Who exactly is X? Who are his parents? Why is he in the Lowlands? As you read, you discover other parts of the mystery as X learns them. The novel is also a coming of age story. While X is dealing with life in the Lowlands and his desire to reunite with Zoe, she is dealing with the death of her father after a caving accident. Part of Zoe's story involves her and a caving expedition. This section was so suspenseful. I really felt as if I was in the claustrophobic cave with Zoe! Can X and Zoe be together even if they come from two different worlds? Read The Edge of Everything by Jeff Giles to find out! I recommend it! 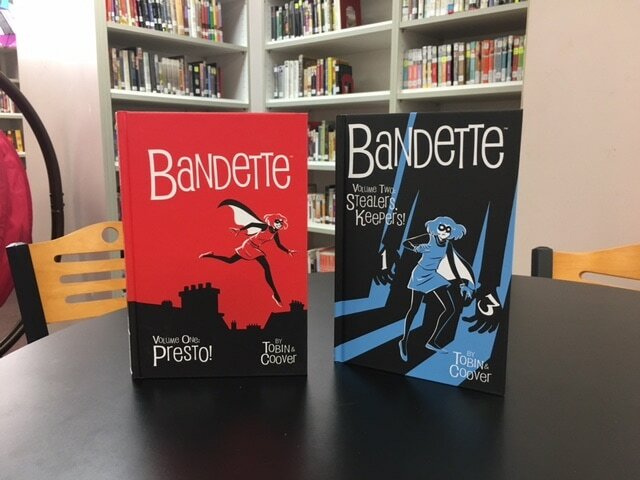 We just added two volumes of Bandette to the Graphic Novel and Manga section of the library. I read Bandette Volume One: Presto! this weekend, and I had to write a blog post to recommend this gem of a graphic novel. 1. I loved all the characters! 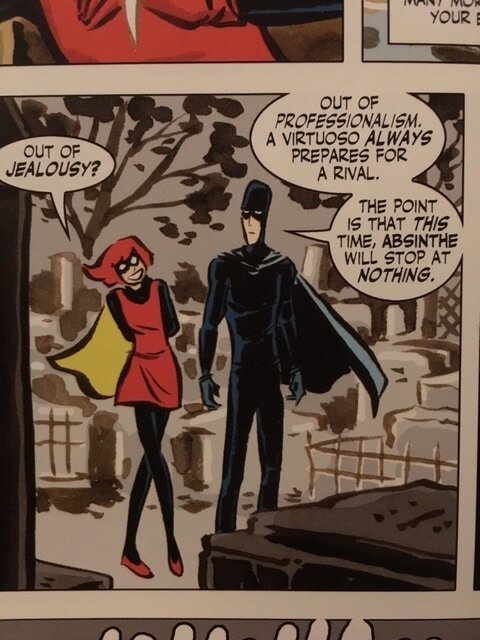 The title character Bandette is a feisty thief who has been compared to both Nancy Drew and Robin Hood. Like Robin Hood, she steals from the rich and redistributes to those who deserve it. Like Nancy Drew, she appears to be part detective. Neither Nancy Drew nor Robin Hood work alone. Bandette has a band of urchins who help her. Not sea urchins! But the other use of the word urchin! 2. I loved the dialogue. All the characters are terribly witty. 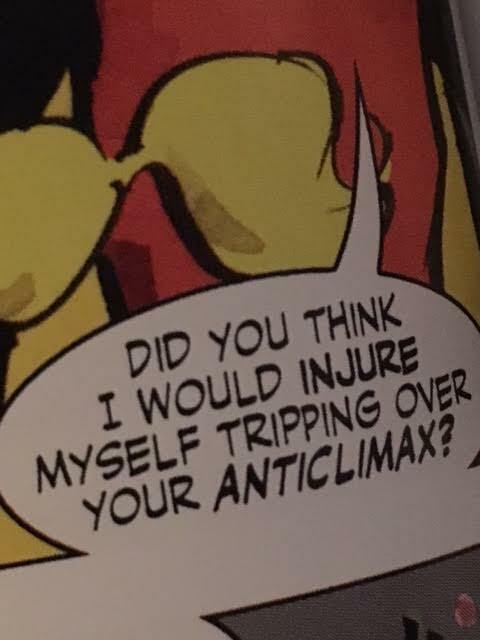 Bandette is exceptionally so. She is rivaled by her archrival, Monsieur who is pictured below in black. Here they have to put aside their differences in order to fight the super villainous group Finish and its leader Absinthe! 3. I loved the setting! Who doesn't like Paris? There is a great scene in Paris's famous cemetery called Père Lachaise. This is a super quick read that is sure to charm and delight. We have two volumes on this comic currently available. Come check it out! STARTING TODAY YOU ARE A HOST! Only those with excellent social standing and those from filthy rich families are lucky enough to spend their time here at the elite private school OURAN ACADEMY. The Ouran Host Club is where the school’s handsomest boys with too much time on their hands entertain young ladies who also have way too much time on their hands. Just think of it as Ouran Academy's elegant playground for the super rich and beautiful. Ouran High School Host Club mangas are amazing books if you are a girl that wants to go on many adventures with a group of boys but just like that manga. There are many other great mangas to read just like the Maximum Ride, ,Bleach, Naruto, and many others. Check them out in the library. The Thousandth Floor by Katharine McGee takes place in New York City in 2118. This twenty-second century story is set in a building know as the Tower, a huge skyscraper that reaches miles into the sky. In fact it hold one thousand floors total. Unlike the present, this building is quite different. It is filled with people from different socio-economic background. They may all live together in one building, but they are certainly separated by class. The poorer inhabitants occupy the lower floors, while the wealthier live at the top of the world. Technology plays a significant role in this time period. Many of the technologies are similar to what we are used to today in the twenty-first century. Texting is now calling flickering. The wealthy do it in their mind using their contact lens while the poor must use tablets. There are no cars that people drive, but rather hovers help the people move to different parts of this city-sized building. Avery Fuller lives on the thousandth floor. Genetically engineered to be perfect, she harbors a horrible secret that can ruin her life. Leda Cole also lives high up in the tower. Her life isn't perfect. She just returned from a summer of rehab. Like Avery, she also harbors secrets. Eris Dodd-Radson was living a privileged life until a family secret destroyed it. She used to live in the upper floors, but her secret has sent her and her mother down tower. Rylin Myers is an orphan helping to raise her sister down on the lower floors. Frequently behind on rent, she jumps at the opportunity to work uptower as a maid to get back on top of things, but this choice leads to a romance that could fall apart once a secret is revealed. Watt Bakradi is the only male point of view in the book. As tech genius, he uses his computer Nadia to help him hack information to sell. Like Rylin he lives on the lower floors, but when he is hired by by another character to be a spy, he is drawn into the world of the wealthy. He deals in secrets and hold his own. The morally grey characters' interactions constantly force a reader to guess who the victim is throughout the narrative. The twists and turns mean the reader will often change his/her mind about who the victim will be. I think that there are many teens who will love this book for its soapy nature and morally grey characters. As in many soap operas, secrets don't stay secret long. When secrets come out, the consequences are explosive. In a nutshell this is a book about teenagers being horrible to one another in the name of social survival. The wicked rivalries, futuristic parties, eerily relatable technology, and mostly absent parents will delight teen readers. NOTE: I've seen other reviewers refer to this book as a futuristic Gossip Girls. I've never seen the show, but I wanted to include it here in case it would motivate you to check out the book! Come to the library to check it out or put it on hold! My favorite Shakespeare tragedy is Macbeth. I read it as a senior in high school. I can still remember my senior year AP English teacher telling us about the themes that we would see in Macbeth: violence begets violence, appearances are deceiving, ambition can be very, very, very bad. 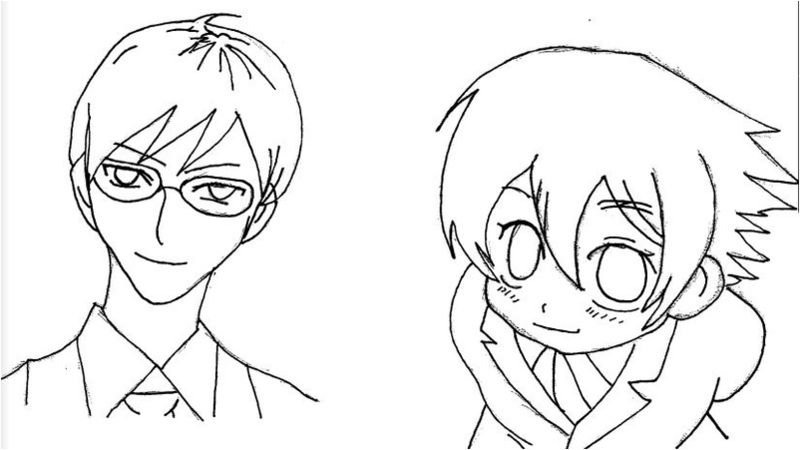 I am obviously simplifying here. I was super excited to hear that there was a new YA book out there that is a modern retelling of Macbeth. Often movie makers and writers like to update Shakespeare. Did you know that the movie Mean Girls is very similar to the play Julius Caesar!? As I Descended by Robin Talley takes the story of Macbeth and transplants it to a modern boarding school in the South. In Macbeth, the main character wanted to be king after his wife Lady Macbeth persuades him to act to grab it; in As I Descended, the main character Maria wants to go after the Kingsley Price, a prestigious scholarship after her girlfriend Lily persuades her. Macbeth had witches; this novel has a Ouija board and ghosts. Both stories feature blood and the consequences of shedding that blood. Even though I knew the story of Macbeth, I was still on the edge of my seat as I tore through this novel. I wanted to see how the story transpires in a new setting. Overall, I found this book to be super spooky. The role of spirits and ghosts and their effects on the characters was eery and spooky. This will be a great read for many teens. If you like ghost stories, you have a good one here. If you are looking for a book with diverse characters, this book is for you. If you like books about boarding school (like I do! ), this one doesn't disappoint. Come to library to check it out or put it on hold! Did you know that you can check out books for the SUMMER? We want to encourage everyone to read this summer for pleasure! 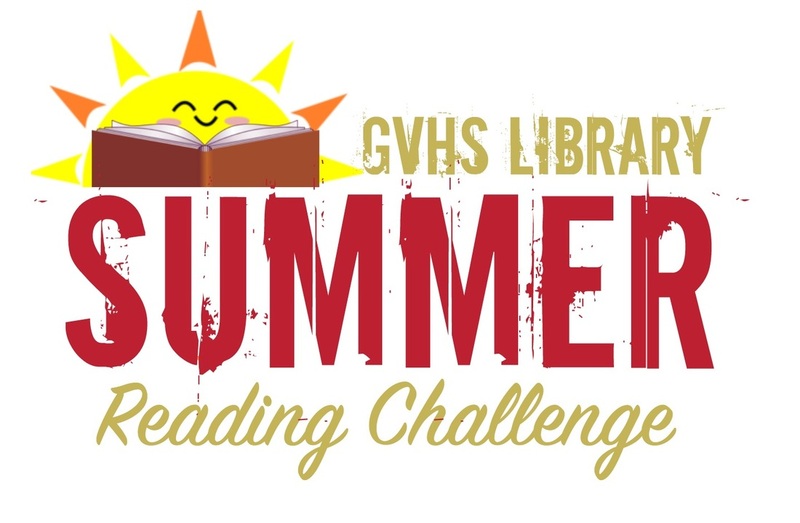 We have created a summer reading challenge for you! All you have to do is come to the library to sign up and grab a bingo card. Try to check off as many boxes that interest you. Shoot for BINGO one way, two ways, or even a full card black out! It is all up to you! ​Come see Mrs. Woodall for more information. Each blog post is written by a different author. 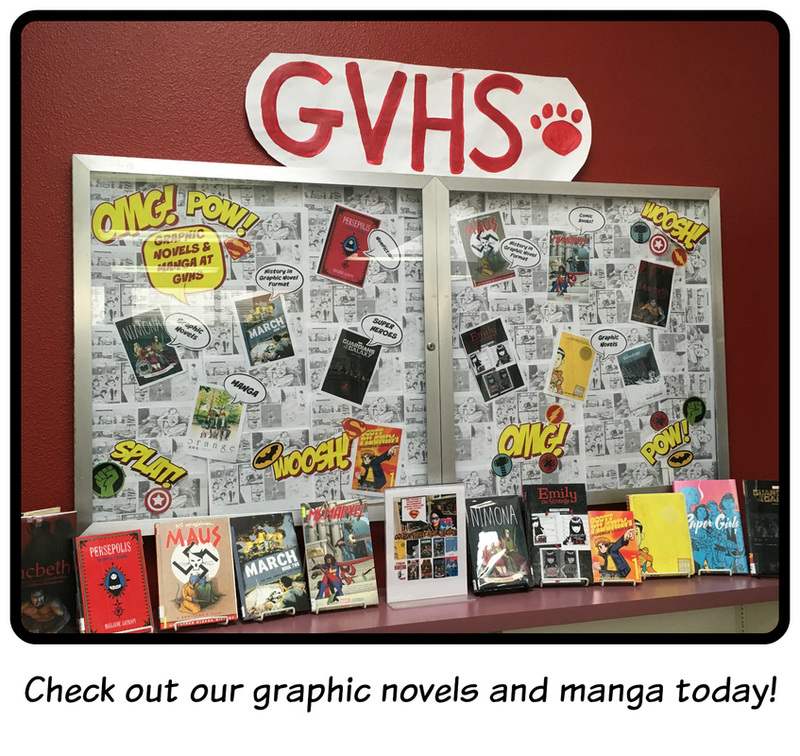 All book recommendations come from Golden Valley Faculty, Staff, and Students.